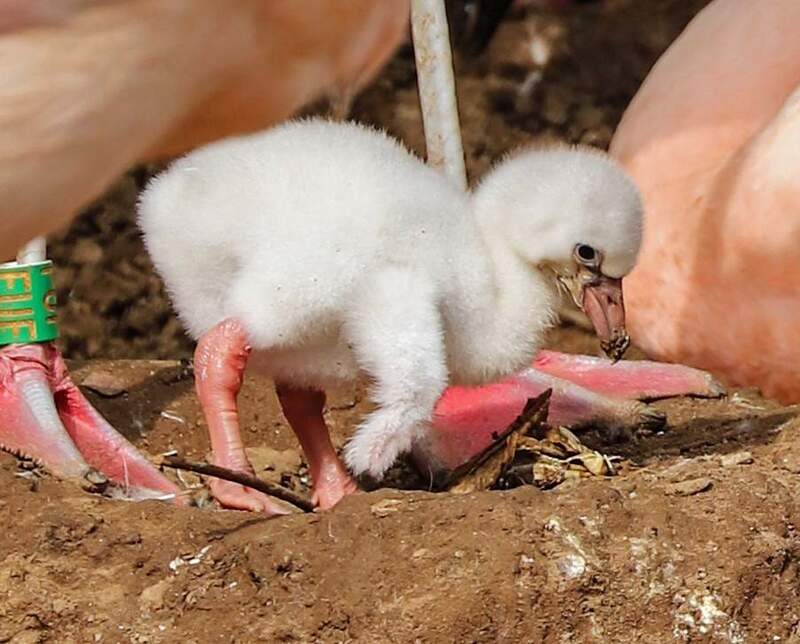 Paignton Zoo Environmental Park has hatched its first flamingo chicks in six years. Paignton Zoo is best known for its flock of some 50 Chilean flamingos, which can be found on a lagoon near the entrance. However, that has all changed, following the hatching of two chicks, with parents protecting them from both the weather and predatory gulls. Flamingo Chicks have both been born small, pale and fluffy. In fact to look at them they couldn’t look any further from the tall, pink, adult flamingos that are best associated with Paignton Zoo. Of course that will all change over the next 12 months. They don’t breed every year and the make-up of the flock changes over time, but now we have a number of birds of breeding age – and the long, hot summer might well have helped, too! Paignton Zoo is renowned for its success with this species of bird. Some of the flamingos that live at Paignton Zoo are fast approaching their 50th birthday. People think flamingos are soft and delicate because they’re pink, but actually they are tough birds that have evolved to live in a tough habitat. The Chilean flamingo or Phoenicopterus chilensis, to give them their Latin name, comes from Chile but can also be found in southern Peru, Bolivia, Uruguay, Paraguay, Argentina and South Brazil. Flamingos are often found in the brackish or saltwater lakes and lagoons in the respected countries mentioned above. This large bird is classed as Near Threatened in the wild. To see the family of Flamingos and potentially get a glimpse of the baby chicks, make sure you pop over and visit Paignton Zoo.